Today’s Wednesday Work Wisdom is conceptual and lays the groundwork for future blog entries where I will provide specific tactics and strategies. In my Monday Morning Movie, I discussed how simplifying your life allows you to worry less about money, freeing you up to be more creative. As an entrepreneur, there are an unlimited number of things I could do in order to grow or improve my business. I could easily keep busy 100 hours per week, and have done so countless times throughout my career. Unfortunately, we often convince ourselves that we MUST work those kinds of hours in order to be successful. The reality is that there is a point of diminishing returns. Although more work might produce more results, the return on the additional effort decreases significantly. Regardless, we keep plugging along because we are programmed to do so. I personally feel like I’m slacking off if I’m not on my computer, on the phone making calls, or meeting with people. For some individuals, they wouldn’t know what to do with their time if their profession did not keep them occupied. There are others who become workaholics in order to avoid dealing with difficult issues in their life. So we keep on working. But what if you were only allowed to work one hour a day? What would you do? I have been experimenting with this concept since the beginning of the year. During the month of January, with the exception of delivering speeches, I have worked a total of 10 hours and have been continuing along that trend into February. Each morning I ask myself, what is the one thing I need to do today? What is the one thing that will create the most value? What is the one thing that only I can do? And that is the activity that I engage in for the day. Eliminate or delegate everything else. 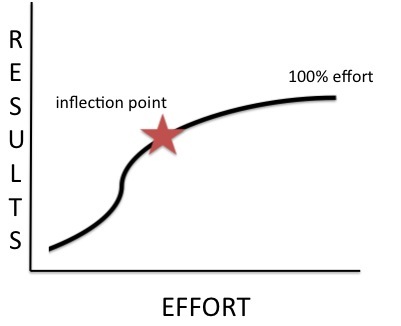 Instead of keeping myself busy and climbing to the top of the “S” curve, I stop at the inflection point; the point of diminishing returns (the star). Pareto would say that 20% of the effort provides 80% of the results. Whether it is 20% or 40% is not important. The key is to find the point where more effort starts producing fewer results, and only you can decide that. Will you achieve 100% of the potential value? Probably not. But is squeezing out an extra 20% of value really worth 4 or 5 times the effort? The key is to focus on activities that will create leverage and will maximize results. You could of course take a vacation or spend more time with family. You could engage in work that is more meaningful. You could volunteer and give back to society. Or you could create a new S-curve. Instead of squeezing out those few extra drops from your current business model where there are diminishing returns, start building a new business or business model that leverages your past success and creates entirely new revenue opportunities. With the extra time created, I’ve been working on a new book that targets a completely different market for me. This will take upfront effort. But when it is done, and I have built up momentum, I will spend less time on that business model, freeing me to create a new set of revenue streams. I am also developing new relationships that leverage my existing content. For example, my content has been licensed to a training company that is now delivering my material to their clients. It doesn’t take any of my time, yet I get residual income. And these relationships free me up even more, allowing me to focus again. Clearly this strategy requires extraordinary partnerships. And as they do more, I can do less. To be clear, I am not suggesting you do a half-assed job. This will kill your business in the long run. And this strategy works best for a business that has momentum; where you are already successful. Once you are successful, you can then reap the rewards. You can implement processes that others can execute. You can delegate, automate, or eliminate the things that are not critical. If you only spent 20% of your time extracting 80% of the value from your business, this gives you 80% of your time to do something different – something more fulfilling, something more enjoyable, or something that can provide even greater long-term value. Posted in blog, Success by Stephen Shapiro on Posted on February 13, 2013 by Stephen Shapiro.